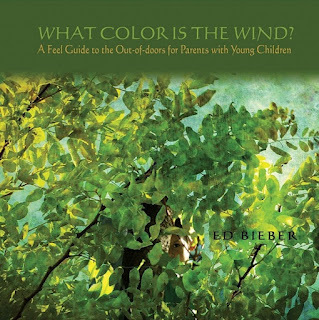 Feathered Quill Book Reviews: Book Review - What Color is the Wind? Author Ed Bieber describes childhood in words that read like poetry. “Children's natural sense of wonder will lead them to smell, touch, listen to, look at, and even taste whatever they find outdoors—they seem to absorb the world through their skin, unable to take it in fast enough.” (pg. 5) He trusts in the ability of children to find their place in nature, to be happy there, and to be kind to each other while outdoors. His argument is convincing, and readers who have spent time with children will immediately recognize the truth in Bieber's words. Our children are indeed curious, observant, creative, and energetic. At the same time it can be hard to get our children to go outside. According to Bieber, researchers have estimated that a child growing up today will spend a total of twenty years of her life looking at screens. (pg. 7) Just as Bieber trusts in the curiosity and goodness of children, he seems, also, to trust in the good intentions of parents. He believes that parents are concerned about the time our children spend indoors, sitting still, and looking at screens. We know that they should get exercise and breathe fresh air. We know that our own busy lives cause us stress and do not wish the same for our children. The reality is that parents' lives are too busy, and so are the lives of their children. Internet and television are everywhere, and many children have become disconnected from the world they live in, seeing it only through windows and screens, rather than experiencing it firsthand. What Color is the Wind? offers a way back from this disconnected state. What Color is the Wind? does not outline the problems that may accompany a child's lack of connection with nature. Neither does it explore the impact of a society which has lost its sense of rootedness on Planet Earth. 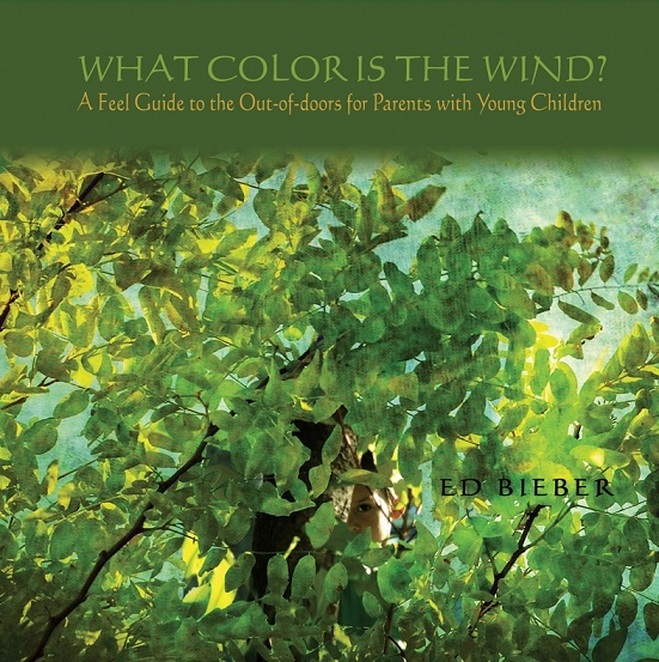 Other books have described these issues; What Color is the Wind? explores a solution. Bieber encourages parents to do two things we want to do anyway—spend time with our children and make some space in our lives for joy and peace. This book is a reminder that this is possible, and that we can start today, regardless of the season. The solution is one that we can execute without buying anything, without even having to take a lot of time from our too-busy days. Many of the activities in the book take ten minutes, though they might inspire a child—or a parent—to spend several hours outside. Immediately following Bieber's beautifully written introduction to children, parents, and nature, are four chapters, one for each season. These sections contain short descriptions of outdoor activities appropriate to the season. Parents do not have to read the whole section at once. They can choose to read about only one activity, just a few sentences. Then it is time to head outside. There is no preparation necessary for the majority of these activities, and for many there are no materials to gather or buy. Each section has some activities for very young children and some that are appropriate for older kids. Some will be fun for all ages, even for adults. Most are simple experiments designed to stimulate a child's—or a parent's—curiosity. If I leave a rock on the ground, what creatures will come to hide under it? Are there different animals if I leave the rock in a different place or in a different season? Bieber also suggests leaving a bowl in different places to see what falls into it or looking in the cracks of the pavement during different seasons to see what collects there. Each activity encourages observation and recording in fun ways. Bieber's tone throughout the book is encouraging and never judgmental. What Color is the Wind? will reassure and empower parents with its supportive words and easy-to-use suggestions. These are complemented by quotations from poets and naturalists that fill the margins of the book. Parents will want to try a few favorite activities, then come back later to read more. They may at the same time find a new quotation to reflect upon tucked into one of the margins of the book. What Color is the Wind? is designed to be used. It even has space for notes inside the book. It has a hard cover and spiral binding that make it easy to tote outside. Best of all, the activities do not require a lot of planning and materials. Buy this book and begin your first adventure the same day with your favorite young person by your side. Quill says: An inspiring and empowering resource for parents and children who want to deepen their connection with nature.